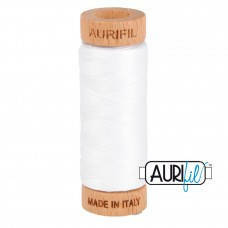 Aurifil 80wt Cotton Mako is the finest Aurifil thread and is perfect for hand sewing such as applique, and English Paper Piecing. It can also be used for Machine Embroidery, Machine Applique and Free Motion Quilting. Contrary to popular belief, it’s not just for hand work! There are so many other wonderful ways to use this strong, yet fine, thread.